Portrait photography captures life and emotions through fleeting facial expressions. Facial expressions that are an insight into the sitter’s personality and mood. Seeing life in the portrait’s eyes, we feel their mind at work. In that momentary facial expression, the portrait captures life, giving the portrait meaning and intensity; an emotional charge. An insight into their soul. 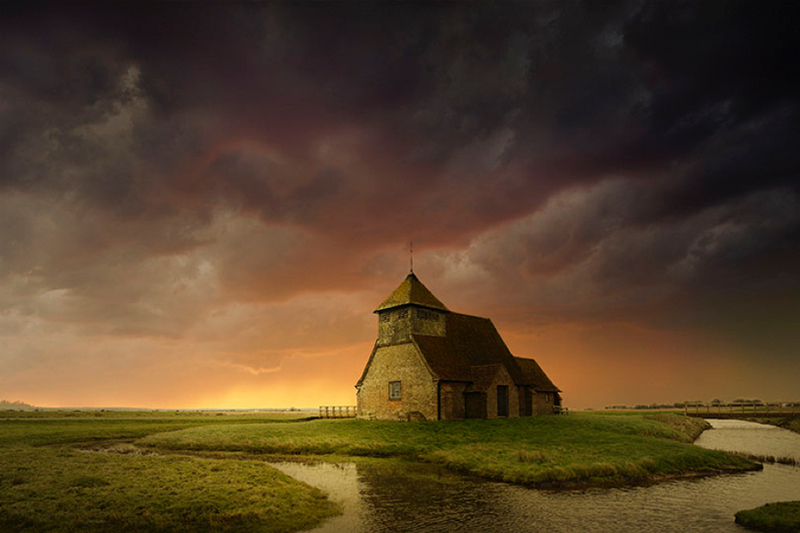 Landscape photography captures life and emotions through the ever-changing light. The weather communicating the landscapes emotions, manifested in the sky, creating the mood. The light and clouds being the expression of that mood; creating the landscape’s emotional charge. The weather is an insight into the landscape’s personality and mood; its soul. People and landscapes are physical objects containing life. People; life comes from within, self-contained. Landscapes; life comes from outside conveyed by light. The sky is the source of all light, is the source of all life in the landscape photograph. In both portraiture and landscape photography, the subjects are just canvases to portray the life and spirit of the subject, their soul; the life and spirit being more important to communicate in the photograph than the physical likeness itself. If eyes are windows to the soul in a portrait, the sky is the window to the soul in a landscape. Light and cloud communicate the soul of the landscape like expressions in a portrait; peace, tranquility, optimism, sadness, anger, loneliness even hostility. We must tune into the subject’s soul first in-order to capture, then communicate a feeling of that soul in our images to make a successful photograph. Photographs that then go on to create an emotional response in the viewer. We should almost feel an invisible presence or spirit when looking at a good photograph. If we fail to capture that quality of life and spirit in any photograph, we end up with a soulless and dead image. The picture fails; we no longer connect with it on an emotional level because it has no emotional quality to connect to. We can only interact with the living, not the dead. It is a one-way relationship, a one-way conversation. We are alone, no feeling of an invisible presence. The photograph remains no more than lifeless tones on paper. No spirit, no value. Dead, it cannot be revived in Photoshop. The aim of this story is to illustrate the importance of the sky in landscape photography; how the choice of sky communicates the life, mood, personality, spirit and soul of the landscape – the story, everything. This then dictates our emotional response to the photograph as a viewer. The sky is as critical to a landscape as the facial expression is to a portrait. The importance of the sky in landscape photography is often overlooked, not appreciated as being one of the most powerful elements of the photograph, its role is often unclear in the photographer’s mind; so not fully exploited for maximum mood and aesthetic benefit in the image. How the images were made. 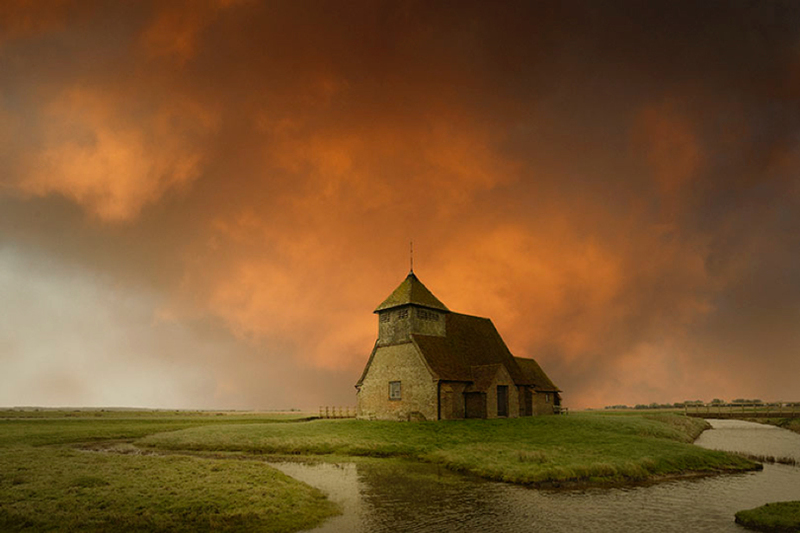 I opened the photograph of the church in Photoshop and stacked each sky as a separate layer, completing the Photoshop process to polish the image as a whole. The ability to turn on and off each sky was retained. This means every image is 100% identical in every way, except for the sky and therefore the mood and story each image tells. Normally, I would ensure the composite was perfect, especially the sky to horizon join and fine tune the tones of the sky further. To keep every image identical except for the sky, these perfections have been intentionally omitted. How much sky is enough? 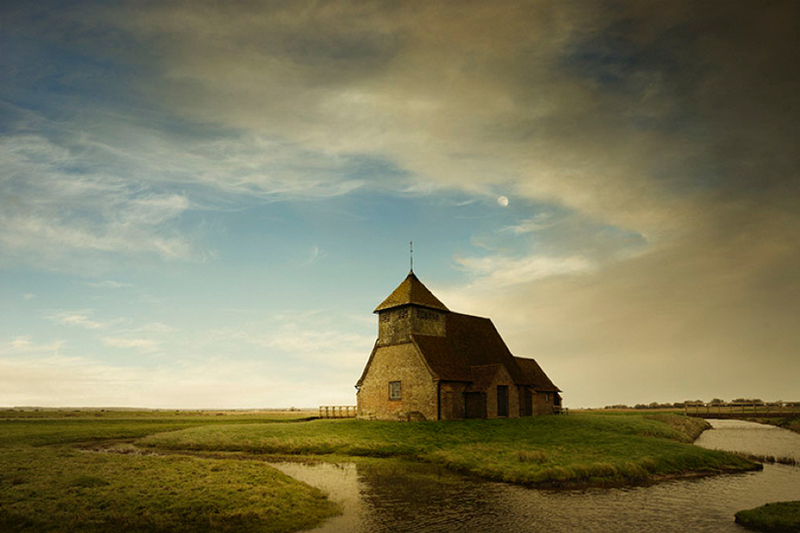 In this image, I wanted to tell a simple story of ‘the church in the landscape’. 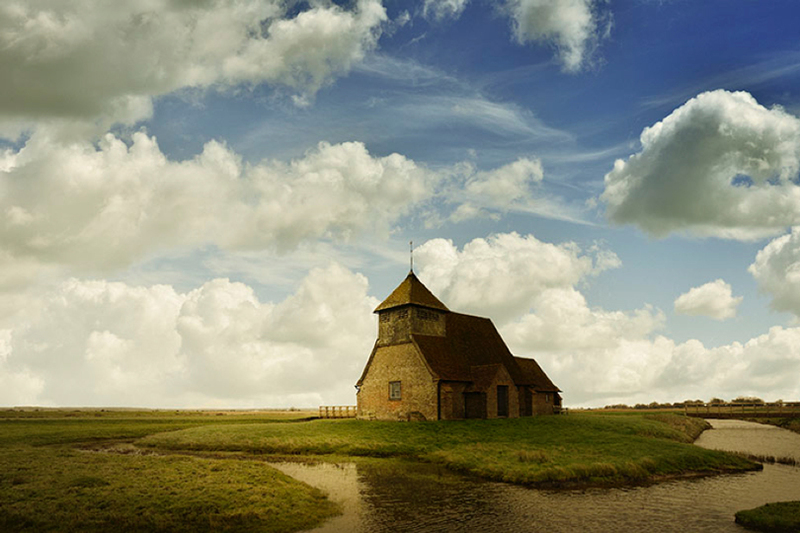 It is a relationship between two elements; a church and a landscape (ground plus sky). Too tight on the church; you lose context. 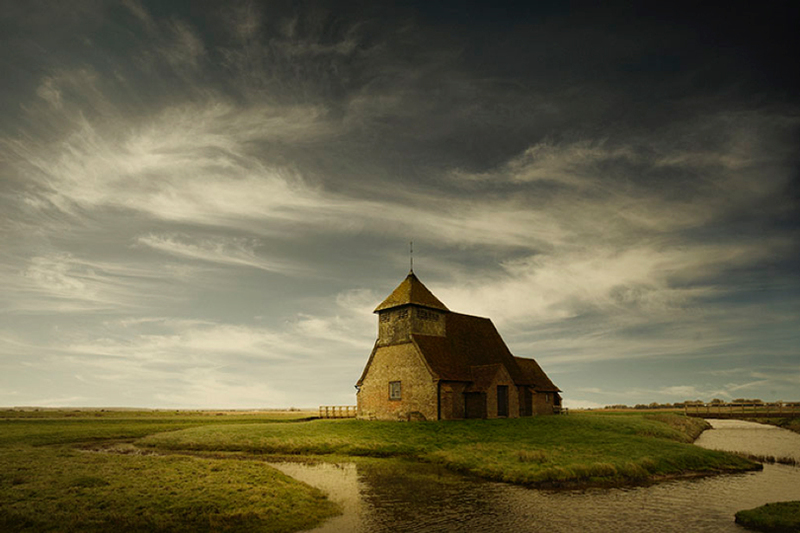 The church becomes just a shot of a building with no story. Too wide, the problem is reversed; the image becomes just a story about the sky. The harmonious balance is simply a gut feeling. 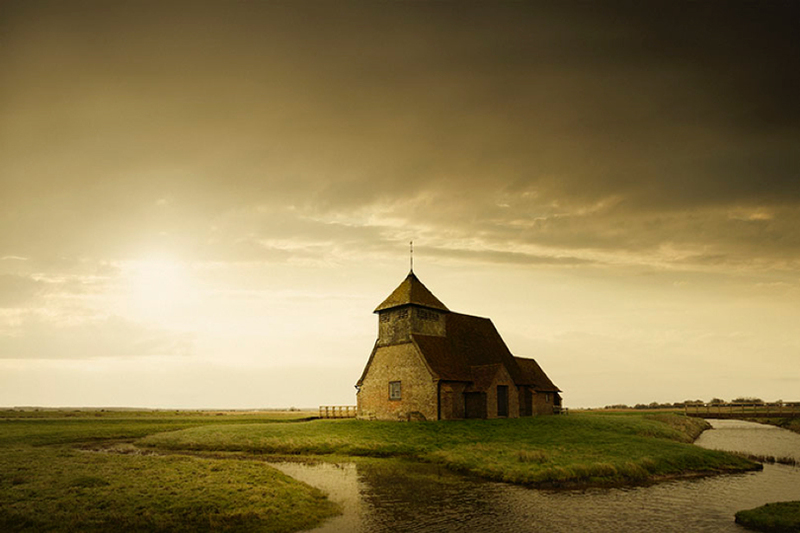 My composition is an attempt to find a balance where the relationship of sky to church communicates a slight feeling of loneliness, by showing there is nothing else around; the church is isolated yet stands solid and proud almost defiant. Timeless. 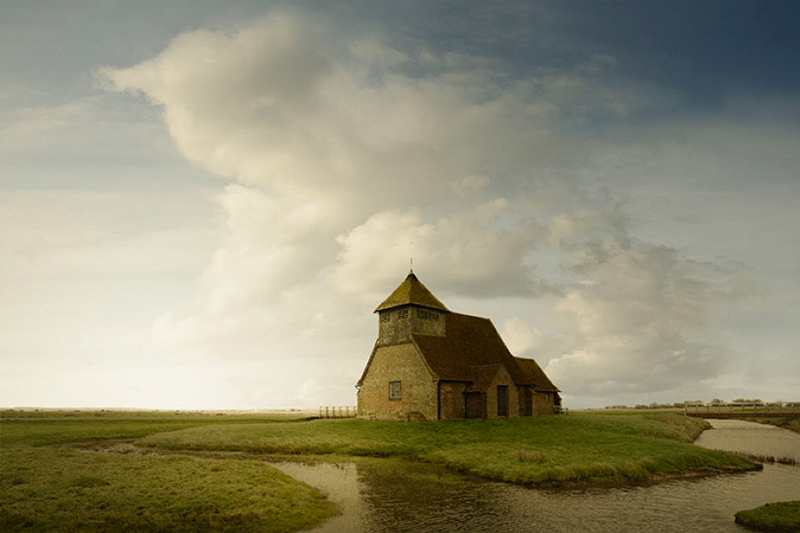 It is finding the right balance of church to sky, that conveys this feeling of isolation; that dictates the composition. Not compositional rules and theory but being in tune with the mood you want to communicate and the story you want the picture to tell. The problem could be thought of as the ‘light source’ and ‘light result’. We always show the result of the light (what lights the ground), but we also need to indicate, sometimes even fully show, where that light is coming from – the sun – telling a complete story about the light; source and result. There is no hard and fast rule. 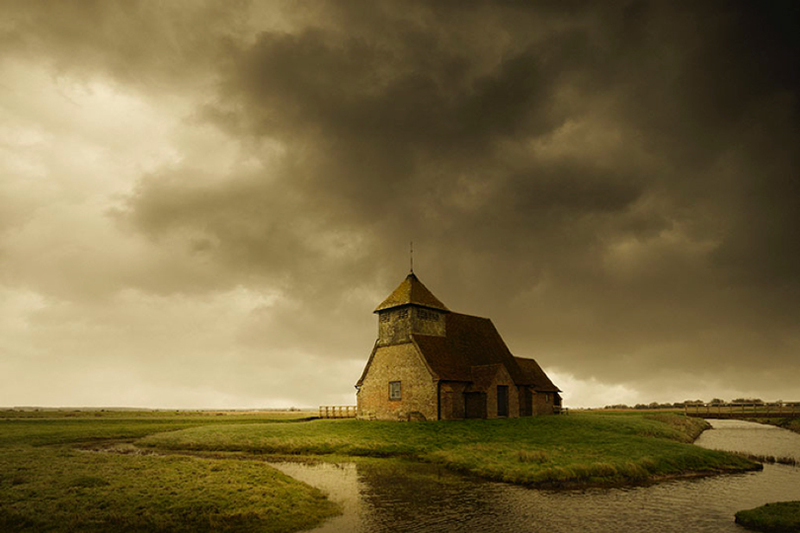 We must compose wide enough to allow enough sky to express its mood, but not so wide we lose sight of the main purpose of the picture, the church. What makes a good sky? Think of the landscape as a theatrical stage. The sky is the stage backdrop, the ground (hills, mountains etc.) the stage floor on which the lead actors and cast perform their play. The cast and actors being the main physical objects in the landscape, in this case, the church. Our eyes are drawn first to the brightest tones in a picture and areas containing the highest edge contrast. In reverse, that means our eyes try to avoid dark and low contrast, flat areas. Our brain needs constant change and variety to keep its interest; finding large blocks of flat even tone boring. Dark areas containing rich detail, make the brain work and keep our interest. Our eyes will look for lines and clearly defined edges, then use them as visual ‘roads’ to travel on and around the image. How do I choose a sky? 1 – Judge the sky as an emotion and on its own first. 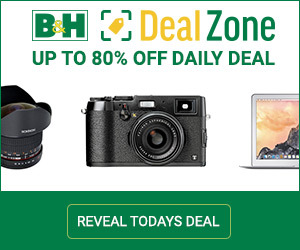 Listen to the sky and the mood it communicates when shooting. What emotion does it make you feel? What single word would you use to describe it? If it were a person, what mood are they in? Angry? Peaceful? Intimidating? Tranquil? Does the sky have a strong, single and clear mood? Or is it in transition between moods, undecided and confused? The clouds should have a pleasing overall aesthetic shape and composition that would make a good harmonious photograph about light and mood in its own right, with its own clearly defined ‘lead actor’. Be careful with clouds at the edge of the frame; calculate what their negative impact on the image is. I like more simple skies with bold designs that have smooth, subtle tonal gradations, uncomplicated and easy to read. Think of the blue sky as negative space, clouds as positive space. All the shapes (clouds) pleasing, graceful and elegant with an overall cohesive design. The relationship of positive and negative space in harmonious balance. The sky should indicate where the source of the light (the sun) is, even if it is not directly shown, with overall tonal variation from left to right and top to bottom that does not allow any large blocks of flat even tone. The tones always in constant change. 2 – Study the clouds and their interaction with the actors. The sky is not allowed to overpower and dominate the actors, remaining only as a stage backdrop. Its light being the stage lighting that sets the atmosphere, everything aimed at enhancing the performance of the actors and atmosphere of the show. The sky should complement the readability of the main actor’s silhouette, the church. The cloud composition should draw the eye towards the lead actors in an easy, smooth and harmonious way at the same time, not creating any visual conflict with the actors such as disturbing lines that intersect the actors in a negative way or creates distracting highlights. The sky should trap the eye in the photograph by having darker tones and limited lines towards the edges of the image; that the eye could be drawn to, then travel on and escape out of the image. The idea is to captivate the eye on the main subject and make it difficult for the eye to leave; keeping the eye a prisoner within the photograph. In general, diagonal lines of visual travel (cloud edges) that quickly transport your focus from the edge of the image directly to the main actors, like an express lane on the highway. Diagonal lines also give a more dynamic feel to the image but done in a subtle way, whereas horizontal lines are more peaceful. Let’s Look at one example of a sky that does NOT work (image below). First, what is the mood? If this were a portrait of a person, what is their expression? There is NO clear expression. We cannot relate it to an expression of any specific mood. The sky is total chaos being too ‘bitty’ and broken up. It is far too busy with no cohesive compositional harmony or main actor, no aesthetic beauty; it simply takes over the image in an ugly way, dominating and over-powering our main hero, the church. The clouds are horizontal, running left to right. Our eyes lock onto the cloud edges on the left, travel across the sky and leave the picture on the right. This is like walking into a restaurant through the front door and walking straight through and out the back door, never sitting down for a meal. The clouds never transporting us to the church. 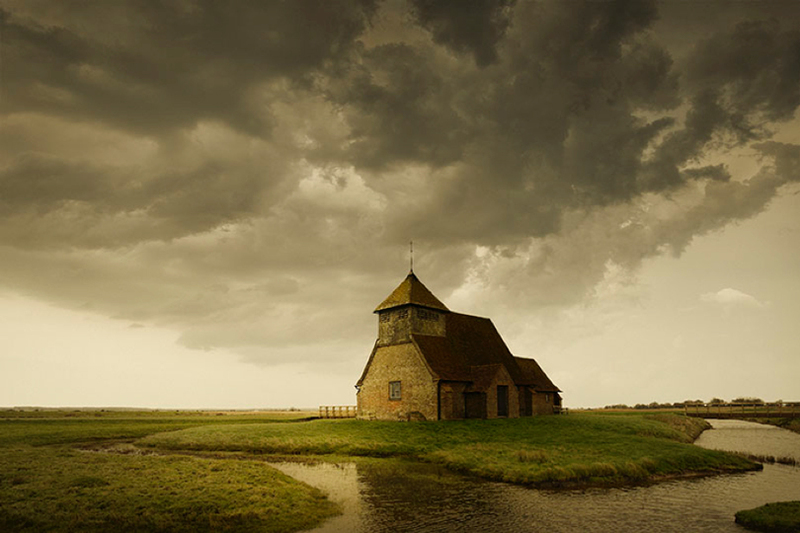 The clouds are too vivid and bold, grabbing our attention, distracting us from the main subject – the church. The clouds lack any tonal variation from left to right and our brain finds this mundane. Conclusion: Contemplate the sky on both a physical and non-physical level. The sky should be treated on two levels. First. On a non-physical level: the life and spirit of the landscape (as covered earlier in the introduction.) Second. On a physical level: treat the sky as a tangible, solid object, as important as any other object in the photograph. Given the dominance of the sky in the image, the sky is often the most important object after the ground. The sky follows the same guidelines as the ground for spatial distance, form, texture, three-dimensionality and composition etc. We must feel the sky has space, volume and depth, alongside the qualities of light and life. The composition and shape of the clouds are no less critical than any other physical object in the image. The final image must work as an overall cohesive composition, with all the components working together in harmony. How can we exclude the sky and clouds from that consideration, simply because they are ‘made’ from air? In the final image, clouds are no less important as a compositional element than any other object. The fact they are not ‘solid’ is irrelevant. Working in our favor is the fact that skies are not generally location specific, if we do not get a good sky when shooting the landscape (ground, buildings etc. ), we can carefully drop in another sky from anywhere in the world that has more pleasing aesthetic qualities. However, capturing the sky at the same time as the landscape would always be the first choice and ideal solution. Most of the time spent photographing landscapes is spent sitting, watching and waiting for the clouds and the mood. This can take hours of constant observation, even all day and still not get an ideal shot. The clouds and mood are constantly changing, morphing from one design and feel to another, traveling around and across the frame, then leaving forever. All the time interacting with the actors as they go. At that decisive moment of harmonious composition, balance and perfect interaction and framing of the main actor, you take the photograph. Landscape photography is like sports photography, only slowed down a thousand times. To ignore the sky is like photographing a portrait without concentrating on the expression you capture. The portrait is all about the facial expression. The expression is everything. The landscape is all about the light and mood created by the sky. The objects are not moving but the light on the objects and the clouds, are always moving and changing, and therefore so is the mood. You cannot capture an image that expresses tranquility, peace or anger; life, if you are not looking for the quality of light and harmonious cloud composition that communicates that mood or spirit. Sky and the quality of light it produces is the key to capturing the physical landscape photograph with life and soul and aesthetic beauty and mood. 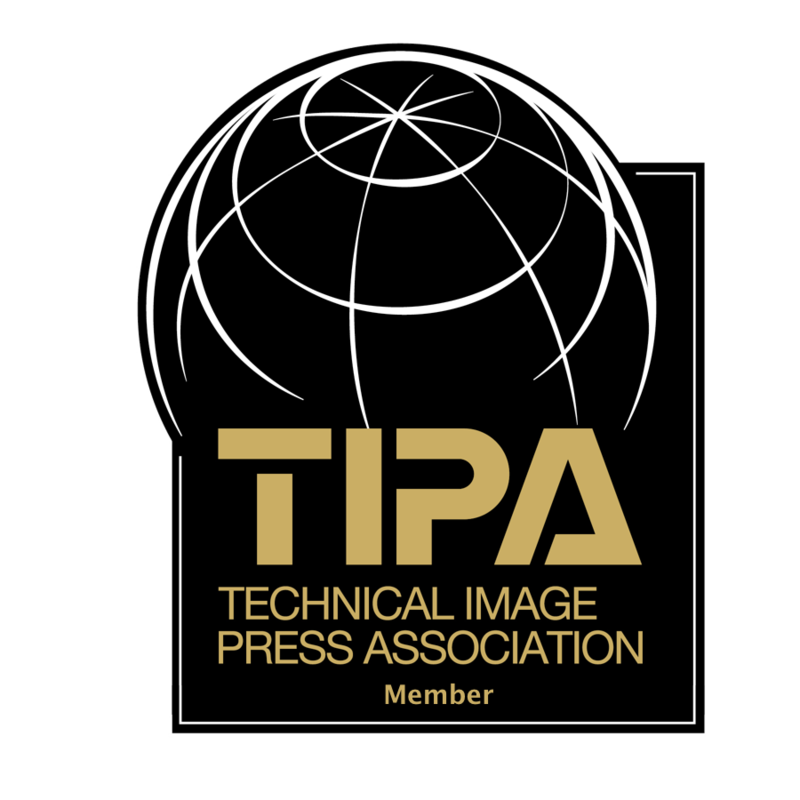 For those wishing to learn more, please visit my website containing tutorials, images and information about the workshops I run worldwide. I teach landscape photography and Photoshop editing combined, with a holistic approach covering all the skills required to make the images shown here from camera to print and understanding aesthetic qualities, all on a one-week workshop. Click here to see more about David’s work, workshops and tutorials.